Yesterday was THE day. The BIG day. The DAY we've been waiting for since November rolled in. 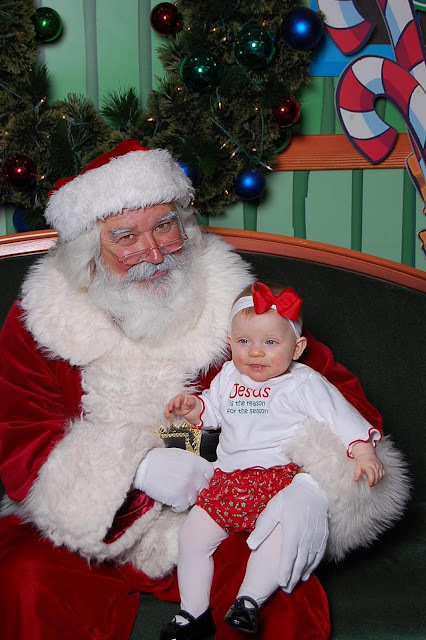 Maggie met Santa. And she did just fine. Everyone we know had been warning us about Maggie getting scared and crying, etc - even the 'elves' at mall told us to take her in facing away from him so Maggie wouldn't see Santa until I sat her down (that seemed too tricksy to me). However, I figured that since - literally - almost every man in her life has facial hair, and she's good with strangers, Santa should be no big deal. And he wasn't. She just stared at him. And patted his fluffy sleeves. She wouldn't smile for the camera, but that's okay. She did so well. And Santa was super sweet - he'd had 4 boys, so apparently he really enjoys getting to hold little girls.